Disclosure: I was not paid or compensated in any way to write this review. I am not affiliated with the company that manufactures and distributes this product. I paid for this product with my own funds. This review reflects my own experience with and opinion of the product as a consumer. 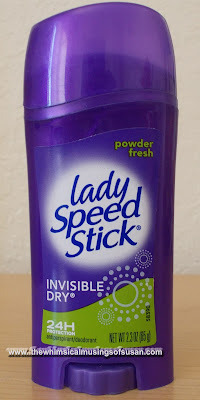 I started using Lady Speed Stick Invisible Dry antiperspirant/deodorant several months ago. My usual brand choices of deodorants are Degree and Dove, which are both manufactured by Unilever, Inc. The 2.3 oz. 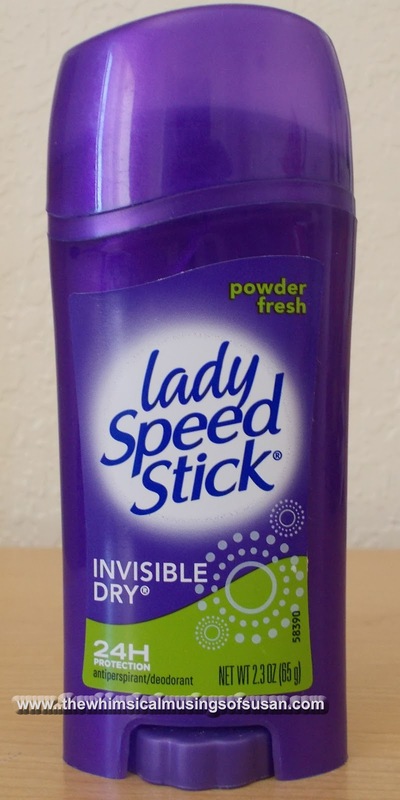 size of Lady Speed Stick Invisible Dry costs about $3, depending on where it’s purchased. I can get this product free or dirt cheap when it is on sale and I use coupons judiciously, though. Anyhow, I think that Lady Speed is a nice, effective product. I like the way that it glides on very smooth under the armpits. Other deodorants that I have used will dry up and form flakes. The flakes tend to get caught in the hair in my armpits. Some of the flakes drop all down my clothing and wherever I may be sitting. I really can’t stand that. Of course, this problem does not occur with Lady Speed Stick Invisible Dry antiperspirant/deodorant. The active ingredient in Lady Speed Stick Invisible Dry is aluminum zirconium tetrachlorohydrex gly 15.4%. The manufacturer claims that the product provides 24 hour protection. I wouldn’t know if this is true, since I shower at least twice a day. What I do know is that it is strong enough to keep me protected at least 12 hours. I normally apply deodorant only once per day, after my morning shower. Lady Speed Stick prevents me from getting musky and sweaty in the armpits while I’m working on the job or exercising. I really like the scent of this deodorant, too. There are other varieties available, such as Shower Fresh and Shower Fresh Gel. Powder Fresh seems to go well with my body chemistry, thus it is my favorite Lady Speed Stick scent. I have found that when I use a deodorant like Secret brand, I smell like musk and fragrance. So, the fact that the pleasant scent of Lady Speed Stick Powder Fresh holds up, is a strong point of the product. One thing that I find a little bit curious is that “Dare to Wear Black-Clear Protection” slogan. This statement implies that no residue will be left on dark or black clothing. The manufacturer states that this product is “formulated to leave no white residue on the skin.” However, if you use too much of the product, you will definitely see that some residue may be left on your clothing. I see and feel a little residue on my shirts even when I apply the deodorant very lightly to my armpits. This deodorant is not truly “invisible dry” as it is claimed to be. If you rub a small amount of the deodorant onto a swatch of dark colored fabric, you would observe that a white streak is left on the fabric. I realize that deodorants are not designed to be applied directly to clothing, but rather applied to the armpits. I say all of this to illustrate a point that the product does indeed leave a residue. And unless you have very pale colored skin and shave your armpits bald, the deodorant is still visible when you go sleeveless. Overall, Lady Speed Stick Invisible Dry, Powder Fresh is a good product. For questions and comments about Lady Speedstick call 1-800-228-7408 or visit www.ladyspeedstick.com.